ITC is believed to be the backbone of the GST. Tax cascading has been one of the daunting flaws of the current indirect taxation system which increases the cost of goods and services. The GST regime is being envisaged to provide seamless flow of credit on goods and services across the supply chain. 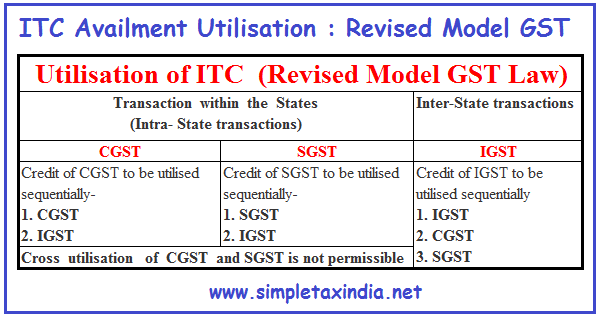 ‘Input Tax Credit’[Section 2(56)] means credit of ‘Input tax’. ‘Input Tax’ [Section 2(55)], in relation to a taxable person, means the IGST, including that on import of goods, CGST and SGST charged on any supply of goods or services to him and includes the tax payable under section 8(3) [i.e. under Reverse Charge], but does not include the tax paid under Section 9 [i.e. under Composition Levy]. ‘Input’ [Section 2(52)] means any goods, other than capital goods, used or intended to be used by a supplier in the course or furtherance of business. ‘Input service’ [Section 2(53)] means any service, used or intended to be used by a supplier in the course or furtherance of business. ‘Capital goods’ [Section 2(19] means goods, the value of which is capitalised in the books of accounts of the person claiming the credit and which are used or intended to be used in the course or furtherance of business. Only the registered taxable person under GST can claim ITC. Application of registration to be made within 30 day: In order to avail ITC on inputs held in stock and inputs contained in semi- finished/ finished goods held in stock on the day immediately preceding the date from which a person becomes liable to pay GST, application for registration has to be made within 30 days. In the absence of any provisions as to eligibility to avail ITC when there is delay in applying for registration under GST, it appears that such credit on inputs would be lapsed and would be available only after the date of registration granted under the GST Law. Specific provision has been inserted which states that ITC in respect of pipelines and telecommunications tower fixed to earth by foundation or structural support including foundation and structural support is to be obtained 1/3rd on yearly basis. Must be in possession of tax invoice, debit note or other taxpaying document(s) as may be prescribed. The goods and/or services must have been received. Tax charged has been actually paid to the appropriate government. ITC made dependent upon payment of tax by supplier: Availability of ITC to recipient has been made dependent on payment of tax by supplier. Thus, even if the receiver has paid the amount of tax to the supplier and the goods and/or services so procured are eligible for ITC, no credit would be available, till the time tax so collected by the supplier is deposited to the Government. Payment of invoice for supply of services is to be made within 3 months: ITC availed is to be added to output tax liability of recipient along with interest thereon, when value of services and tax is not paid within 3 months from date of issue of invoice by supplier (similar to current CENVAT provisions). However, the law is silent as to when such credit can be reclaimed again on payment of invoice. Time limit for availment of credit: ITC shall not be allowed after furnishing of return for September month following the end of financial year or furnishing of relevant annual return (December 31 is the due date for filing annual return), whichever is earlier. Proportionate ITC to the extent used for business purposes is admissible when goods and/or services are partly used for other than business purposes. ITC is restricted to the extent of taxable supplies including zero-rated supplies, when goods and/or services are partly used for effecting exempt supplies including supplies under reverse charge basis. ITC shall not be allowed if depreciation is claimed on tax component of cost of capital goods. Registered taxable person is entitled to take credit upon receipt of last lot or installment, where goods against an invoice are received in lots or instalments. Motor vehicles and other conveyances except when used for further supply of such vehicles or conveyances, transportation of passengers and goods, imparting training on driving etc. Goods and/or services like food and beverages, outdoor catering, health services etc., except where inward supply of particular category is used for making outward taxable supply of same category. Membership of a club, health and fitness centre. Rent-a-cab, life insurance etc., except where it is obligatory for an employer under any law in force. It is suggested that ITC, beside on rent-acab, life & health insurance, should also be allowed on the services such as outdoor category etc., when it is obligatory for an employer to provide to its employees under any law for the time being in force. Works contract services when supplied for construction of immovable property, other than plant and machinery, except where it is an input service for further supply of works contract service. Goods or services received by a taxable person for construction of an immovable property on his own account, other than plant and machinery, even when used in course or furtherance of business. Goods and/or services on which tax is paid under composition scheme. Goods and/or services used for personal consumption. Goods lost, stolen, destroyed, written off or disposed of by way of gift or free samples. Any tax paid in terms of Sections 67 (i.e. in fraud cases), 89 (i.e. detention and release of goods and conveyances in transit) or 90 (i.e. confiscation of goods or conveyances and levy of penalty). Can Work Contractor claim ITC on Workman Compensation insurance policy taken it for contract work. we one firm with GST and work with goods transport service. Now we are starting truck body fabrication work. Please suggest we should work in this firm or registered new firm for this work proprietor will be same.